Unispace Sunderland is this week hosting an event focusing on architectural glass, at its National Glass Centre (NGC) building. The Symposium in Architectural Glass, which takes place between 17 and 18 May, will see 120 delegates visit Unispace for plenary sessions at the NGC and a dinner in the museum’s restaurant overlooking the River Wear. The occasion marks the second time that the University of Sunderland's NGC has hosted the event, which will include lectures, panel sessions, workshops and networking sessions. The symposium has been part-organised by the NGC-based International Research in Glass, and Professor Sylva Petrova of the University of Sunderland. 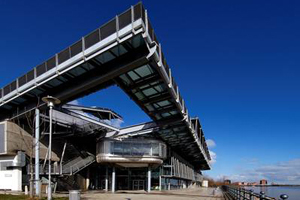 Sharon Olver, the University of Sunderland’s commercial manager, said: "The National Glass Centre is an architecturally unique building that houses a national museum and visitor attraction. We are delighted to be hosting this prestigious international event which addresses the latest thinking in glass technology."